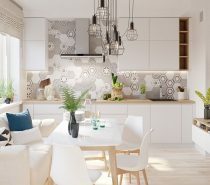 A dazzling white dining room may raise a few eyebrows among parents of spaghetti slinging toddlers, but in this age of wipe clean modern furniture materials and washable paint finishes this crisp and clean look can belong to anyone. 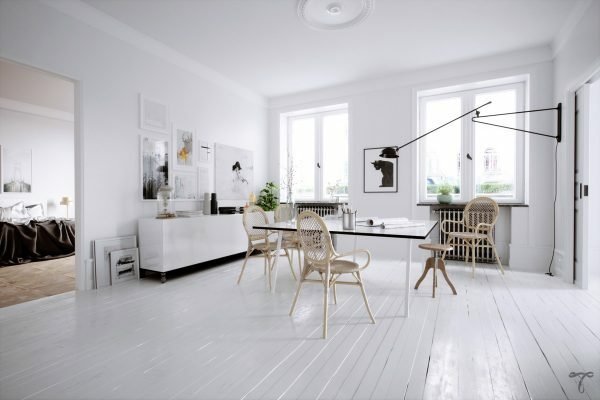 Some may be concerned that a plain white space could lack in personality or individuality. 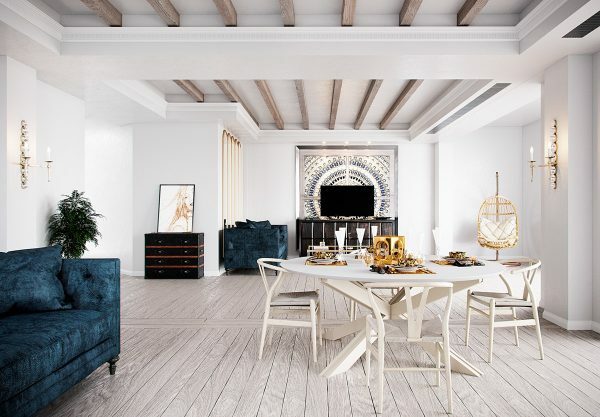 However, this is not the case in any of these 33 dining rooms that utilise beautiful accessories to make each decor scheme completely different to the next. Join us on a journey to discover distinguished dining sets, statement dining table pendant lights and a sprinkling of bright accent ideas. Crown your dining spot. 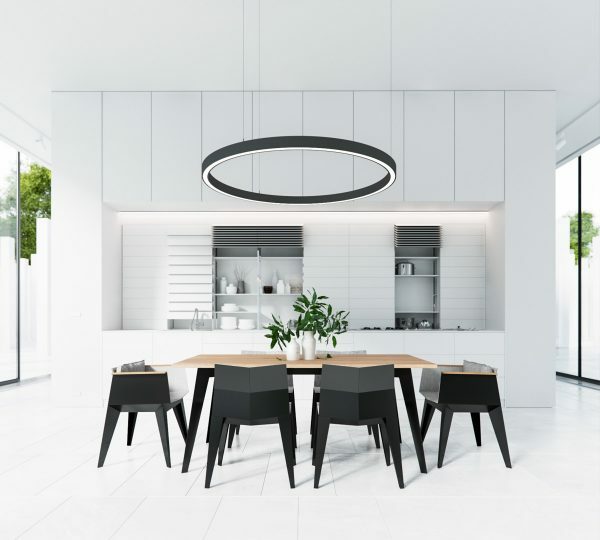 A modern chandelier hovers like a halo over this heavenly black and white dining room. Wood tone and greenery breath life onto the blank canvas. 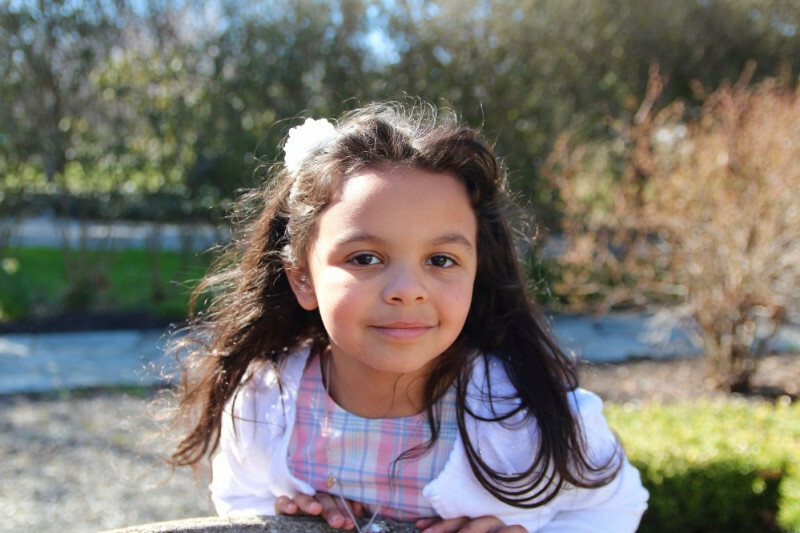 Let treasured items inspire your scheme. A colourful travel poster is the inspiration for the tropical palette of this coral and green accented scheme. 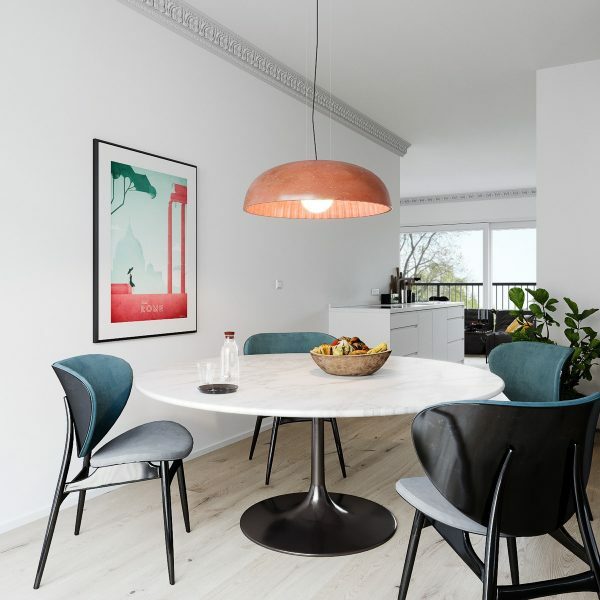 Jade green modern dining chairs encircle a round dining table with a white marble top, under a coral coloured dining room pendant light. A bulky white dining room buffet blends into the background. Add a look of expense and luxury with golden trims. 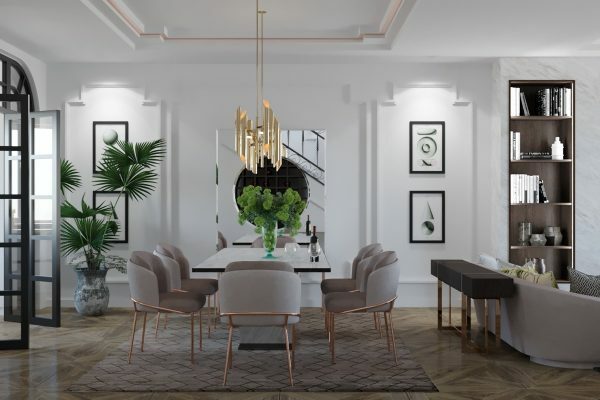 The subtle sheen brought by a gold dining pendant, slim ceiling inlay, and the golden legs of chic grey dining chairs and black console unit simply oozes upper class. Don’t go overboard on this metallic though as it will have the entirely opposite effect. Don’t be afraid to mix things up. 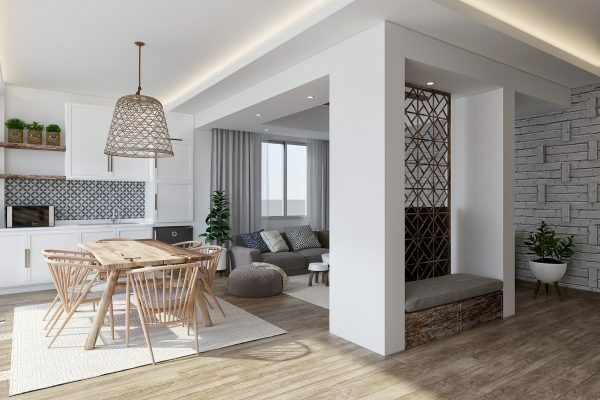 With a plain white backdrop and a clear glass dining table, this room scheme could afford a little mix and match when it came to selecting the dining chairs. Contrasting colour accessories give maximum impact. 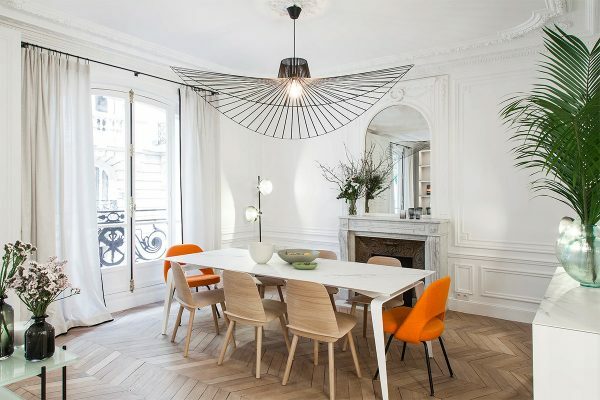 Three orange tinted versions of dining ghost chairs add extra interest to this carte blanche. 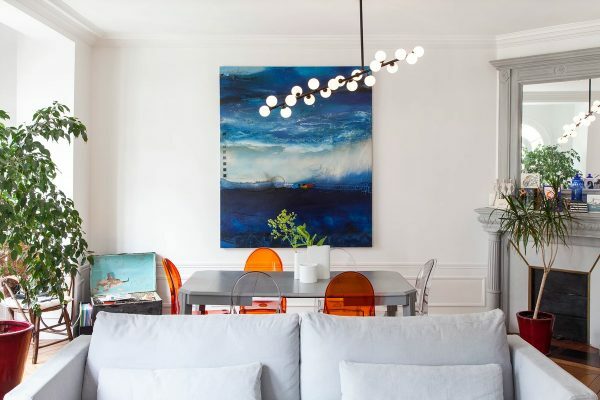 A blue based art canvas lends terrific contrast to the tangerine chairs. Blue and orange accessories pop out from white decor around the room. Introduce a colourful area rug. 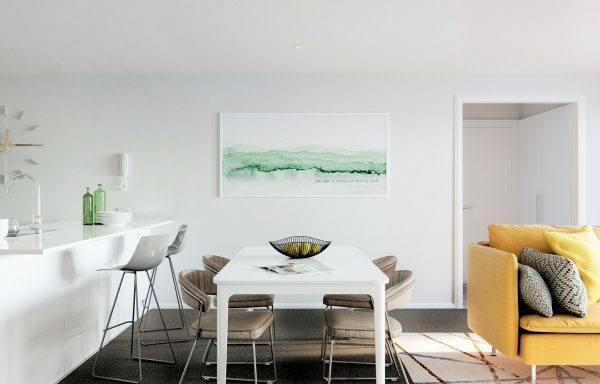 Just because your walls are painted white doesn’t mean you can’t be seated in a colourful dining area. This striped red rug design is matched by dominant red artwork. 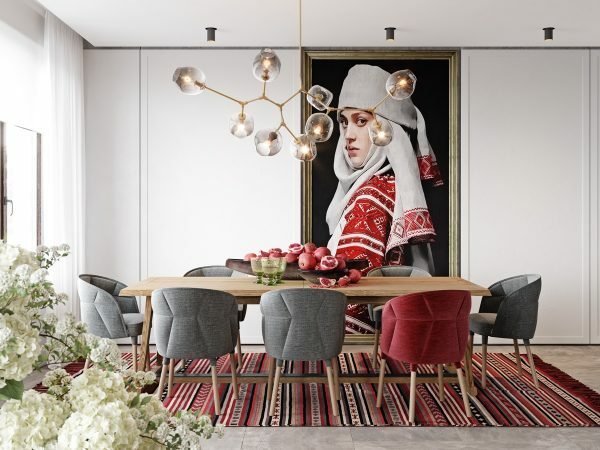 A single red accent chair is quirkily positioned along one side of the extendable wooden dining table, rather than placed at the more obvious head of the table. The shape of the dining pendant light emulates pomegranate seeds, which can be seen tumbling from the table centrepiece. A similar chandelier is available here. Balance the space. 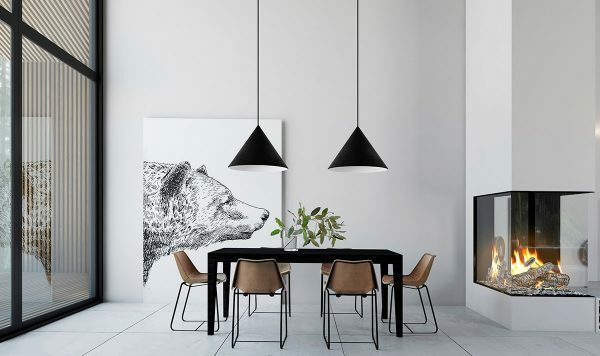 The dark wirework shade of this Vertigo pendant spans the entire length of a bright eight seat dining set, made up with the Muuto Nerd chair and Saarinen executive side chair. 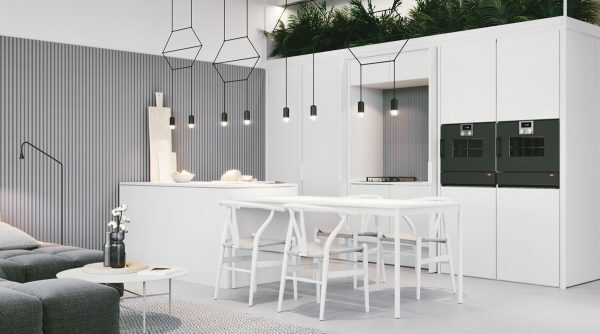 Mark out your dining zone with multiple pendant lights. 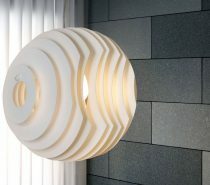 Low hung lighting visually anchors a centrally placed table to its spot. Incorporate existing built-in seating as a banquette bench. 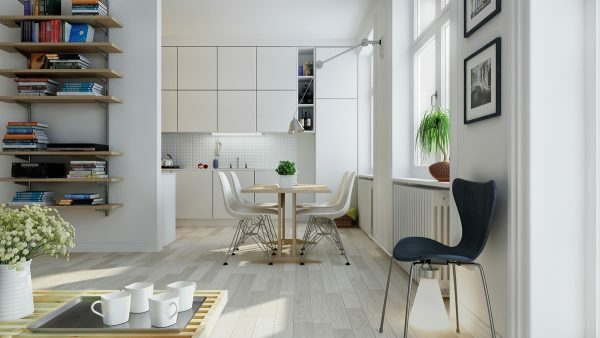 This white dining room set is positioned up against a window seat to save space – it also saves on splashing the cash on extra dining chairs. Wood and white for the win. 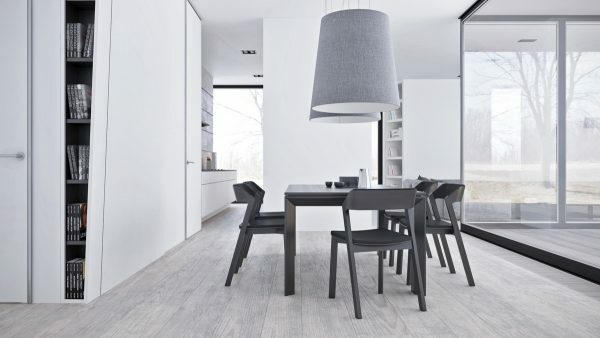 A wooden dining set makes a perfect warming addition to icy dining room decor. This wooden sculptural chair design is the Genny Easy chair by Morelato. Bespoke designs can save on space. 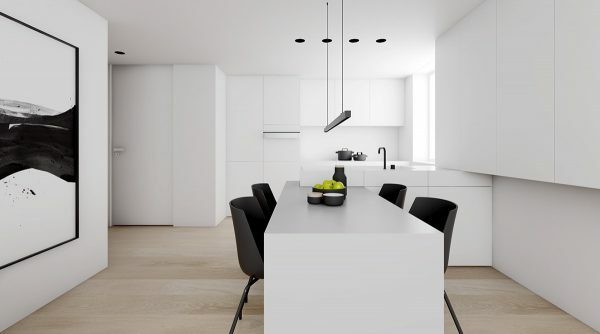 A white dining room table and chairs morphs with a kitchen island here, creating a streamlined design. A dining bench can seat extra guests. Impromptu diners can be accommodated by budging up on this black and white dining room set with bench. Introduce some pattern. 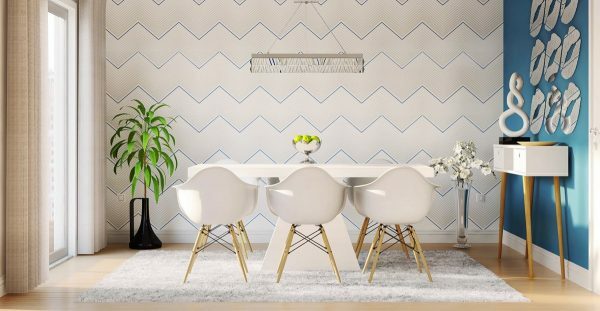 A chevron feature wall has been created behind a pure white dining room table set, in this cheerful blue and white dining room. 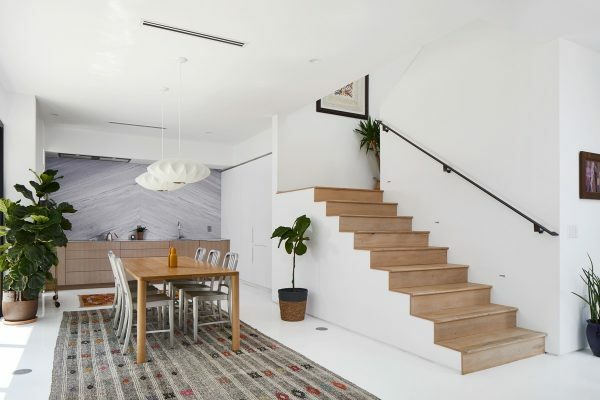 The modern white dining room chairs are the Eames armchair. Let the shelves do the talking. 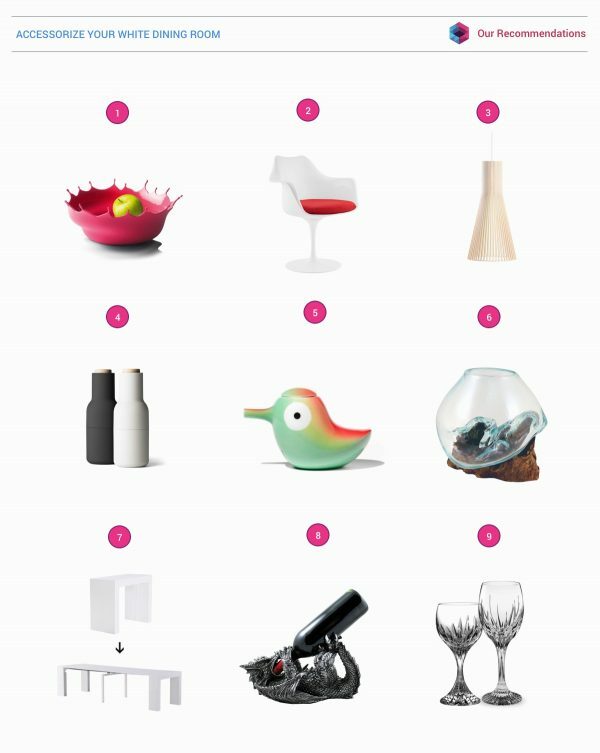 At least, let the contents of your shelves be the loudest part of quietly colour free decor. Recessed shelving makes a modern change from a more traditional white dining room hutch. Do the legwork. 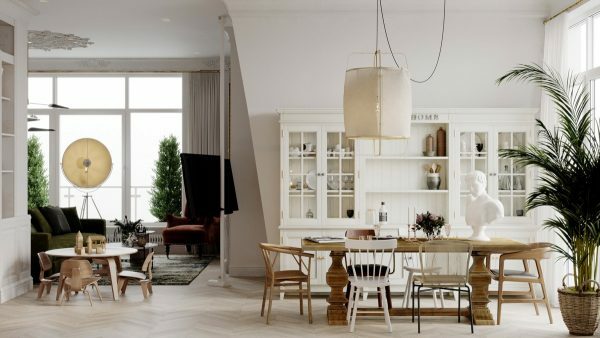 These white dining room chairs have Eiffel Tower inspired legs that bring a look of strength to a gentle white scheme. Don’t underestimate the power of plants. 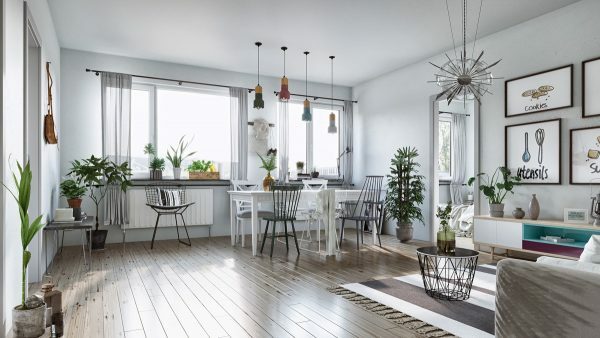 Indoor plants are an easy way to add flashes of greenery to a plain looking room. Think outside the (white) box. 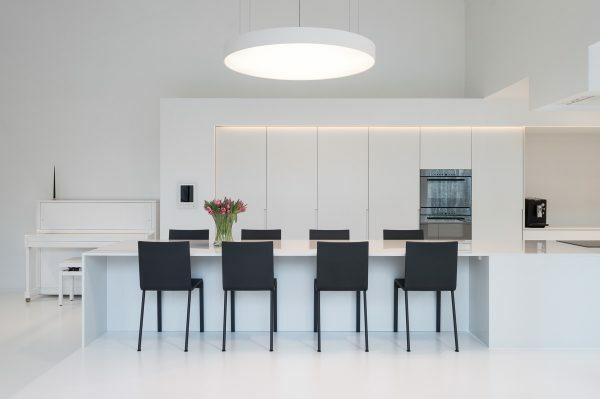 A swing arm wall lamp is a novel way to add lighting over a dining room table, and this black Flos Mod 265 is just the ticket to complement a modern white dining room table. A cheaper replica is available here. Make your table centrepiece suit your needs. You don’t have to splash out on fancy candlesticks if you’re not the dinner party type. A simple modern fruit bowl will do. Add colour in unexpected ways. 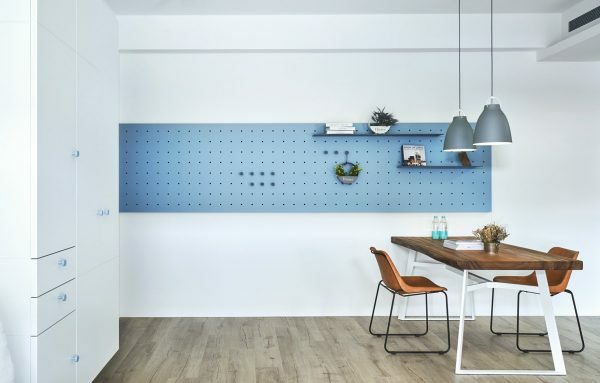 A blue pegboard wall behind two Caravaggio Pendant lights provides a repositionable shelving system, plus wall hooks where and when they’re needed. Make a shy white scheme blush. This blush pink dining table makes a sweet departure from the surrounding monochrome scheme. Different white dining room chair designs keep the set looking fresh. 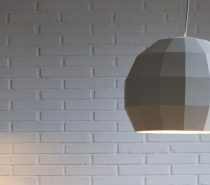 The dinky globe pendant lights are the Flos String Light Round. 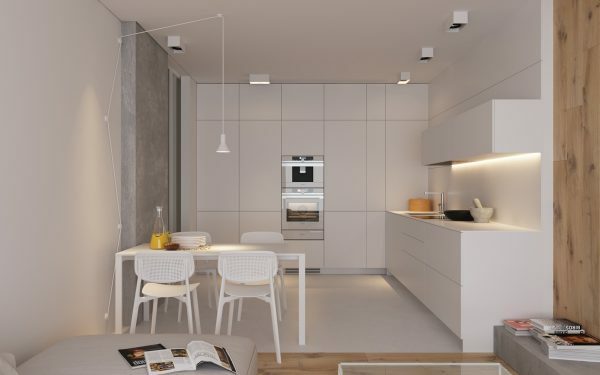 Geometric accents bring edge to any scheme, like these Vibia Wireflow 2D pendants. A roaring fireplace adds movement, colour and light. 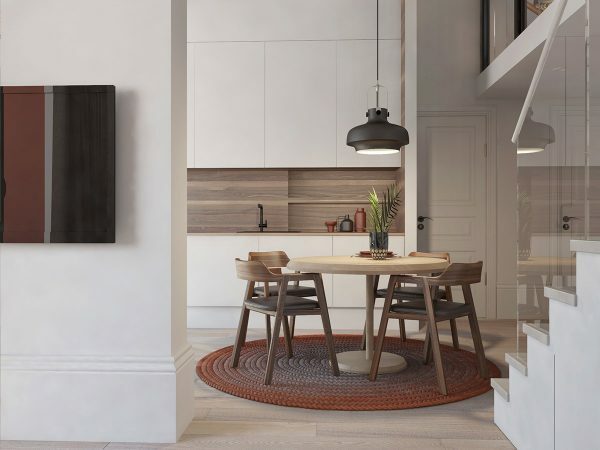 Large artwork can be propped on the floor behind the table for a change of scene. Kitchen bars aren’t just for breakfast. 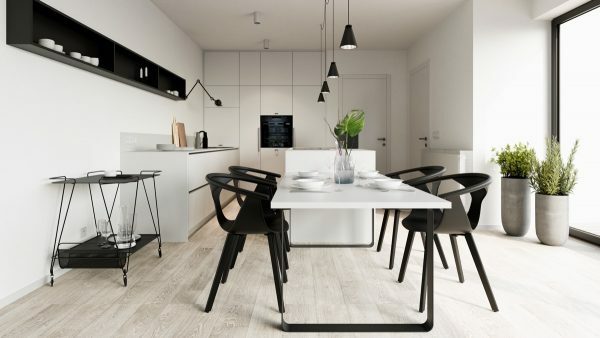 This tall and elegant black and white dining room set is made by placing modern dining chairs at a sleek kitchen bar. 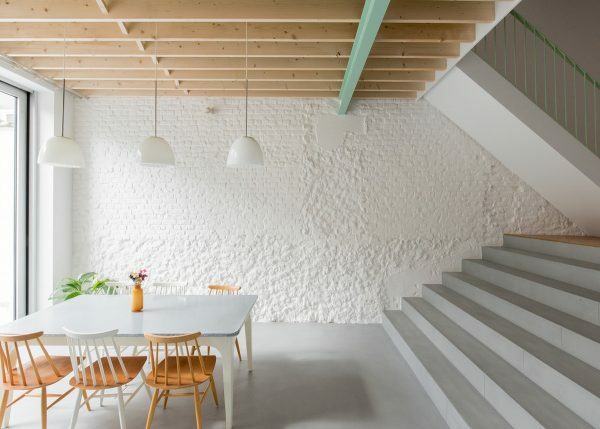 Linear thinking makes light work of minimal spaces. 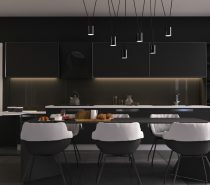 A striking linear suspension lamp looks crisp over black and white dining room sets. Maximise on monochrome. A black and white dining room table takes on a new dynamic amongst chunky black accent pieces. 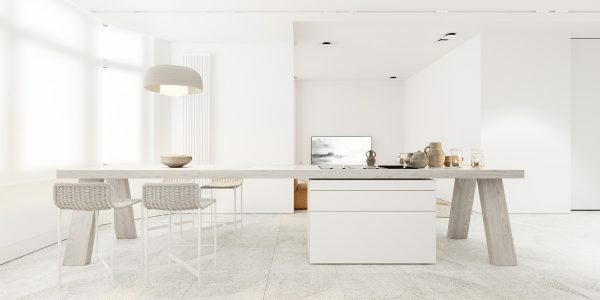 All white dining room sets blend in unobtrusively in a white kitchen diner setup. Earth tones add depth and warmth. 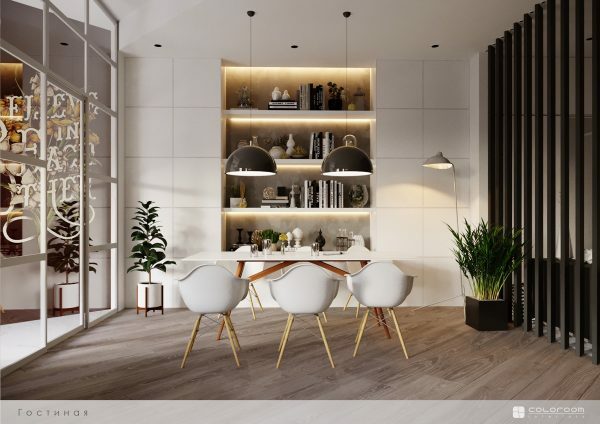 Choose a white dining room cabinet that has wooden shelving nooks, or layer a wooden dining set in front of plain white dining room furniture. Make a centrepiece with a ceramic vase of green fronds to finish the look. Off white dining room sets have a softer look. Use your table top as a canvas for colour. Display elaborate artwork right on the table. Add pops of colour with pendants. 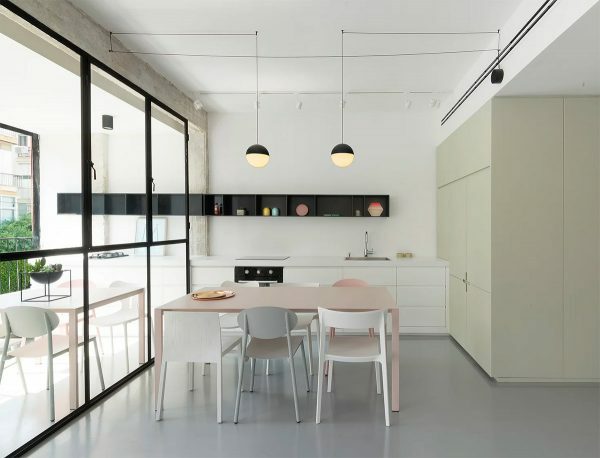 Colourful wood and concrete pendants colour this monochromatic Scandinavian dining room. 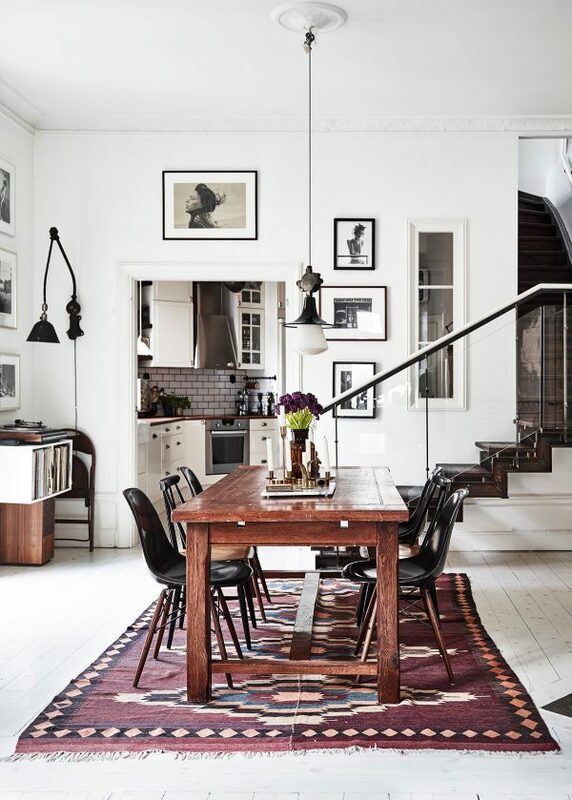 A mismatched selection of black and white dining room chairs add to the quirky eclectic aesthetic, placed around a plain white dining room table.